As the saying goes, youth is wasted on the young. The brainchild of Never Shout Never, Christofer Drew, kindly refutes that concept. At the age of 24, Drew and his band Never Shout Never have released seven full-length albums and two EPs. A prolific songwriter since 16, Drew’s upward trajectory as a lyricist and tunesmith has continued to evolve and push boundaries with each new release. This is evident on the band’s latest album Black Cat, a journey of love, loss and acceptance. 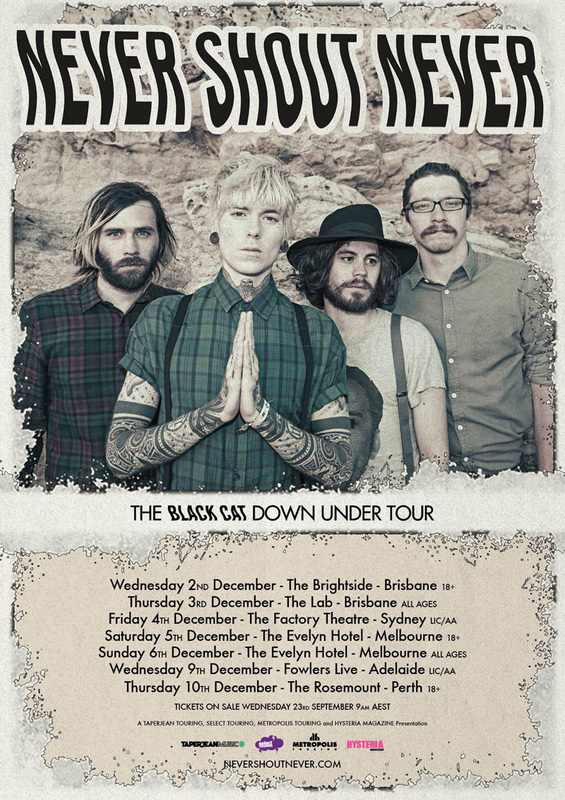 Having wowed their fervent fan base on Soundwave Festival back in 2011, don’t miss Never Shout Never on their first headline tour of Australia. Tickets on sale 9am Wednesday 23rd September.